This Professional EMT style first responder medical kit in a navy blue bag was designed for trained medical professionals, with kit contents validated by EMTs, firefighters and nurses. 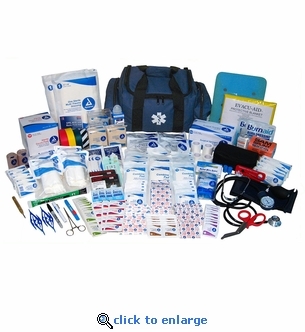 This 568-piece medical kit comes fully stocked with an extensive assortment of trauma and first aid supplies for use in a wide range of emergency situations. The "Easy Access" professional grade responder bag has multiple pockets to help keep supplies organized, and includes extra space for any additional EMS, EMT or paramedic supplies.